Advent Vega Tegra Note 7 Review. 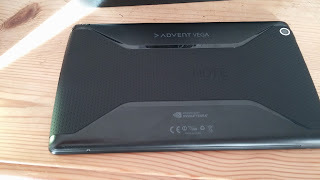 The Advent Vega version of the Tegra Note 7 comes in a rather unassuming cardboard box. It's not really the most appealing of boxes in any way. 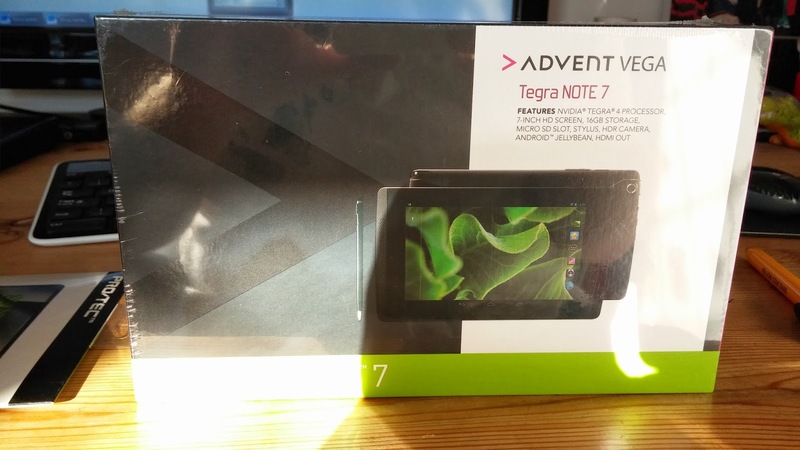 There's a picture of the tablet on the front of the box, with a brief list of specs and on the bottom of the box there's some promotional writing saying the most exciting points about the tablet. Suffice it to say that if this box was on the same shelf as any other well decorated box this device would be ignored. Thankfully though, we can say that the box itself it utilitarian - it just does the job and as our mothers would say, it's what's on the inside that matters. Sliding open the box you'll be greeted with a quick start guide and then the tablet in a nice, soft feeling plastic sleeve. The inside of the box smells like factory and new-ness, I know there's some weird people out there that like that smell! Aside from the device there's a micro USB cable and a three pin wall plug for charging and that is it. Literally nothing to get excited about here, but this is a budget tablet, so all of the essentials are here. Just a heads up though the micro USB cable is painfully short, so you might find yourself reaching for a new one after a few charges! 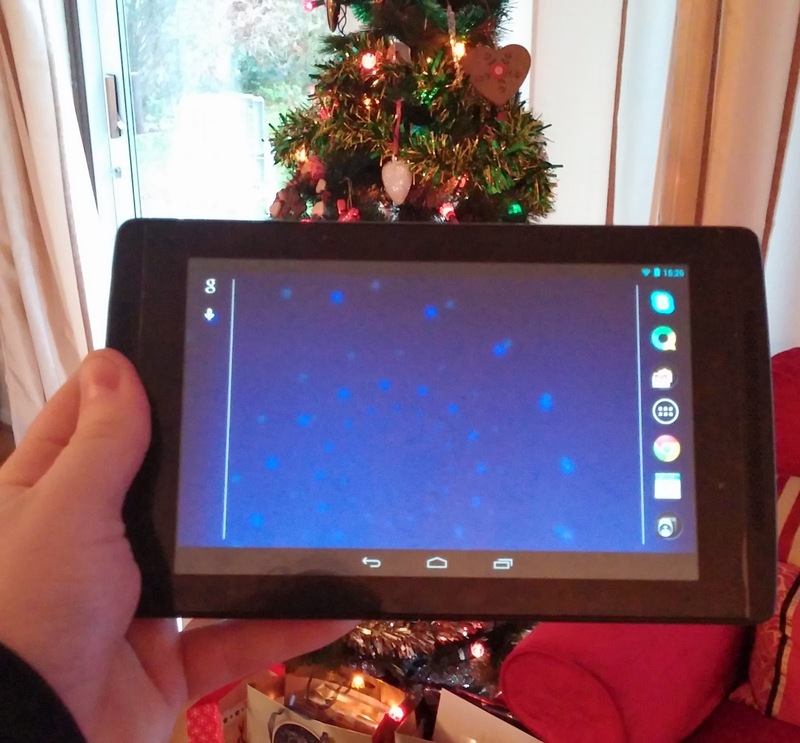 Once you're past the box, then you'll have your shiny new tablet in your hands. For those of you who like screen protectors, you'll be disappointed to know that there's a piece of plastic on the front of this which is designed to be pulled off, so there's no factory installed screen protector here. The device itself is really nicely designed. Given that the tablet is made of plastic in a bit to keep the price low, the variation of materials and the rather unique or, as some have labelled it, 'aggressive' styling makes it stand out from the crowd! 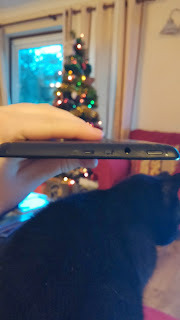 It's hard to tell that this is meant to be a budget tablet from the outside, until you get to the power key and volume rocker, they're horrible. The plastic is slimy and compared to the power buttons which Samsung use on the side of their devices, it's just not very nice. The power buttons clicks well, but we're not convinced by the potential longevity of the buttons. with the front-facing camera at the top, then you'll find the power button is on the the top right, to the left of that is the 3.5mm headphone port, then there's the micro-HDMI out port and just beside that is the micro-USB port. Everything is on the top edge, aside from the slot of the capacitive stylus, which is on the bottom right of the device in portrait. We're not sure if this is an issue just yet, it's not been in our experiences when we've had headphones plugged in and had the tablet charging, but we can imagine it could be if you were to hook this thing up to your TV, because it'd get mighty crowded on that edge! The volume rocker and MicroSD card slot are both on the right hand side towards the top of the device. Other than that, the device is thin, well weighted for one hand use and the speakers are on the front, with a bass port on the bottom of the device! But, we'll come to that later! The display is probably the of the weakest parts of the device. The 7" screen carries a resolution of 1280 x 800p, which is perfectly acceptable for 2012 and indeed for a budget tablet, but it's not the best screen on the market. The brightness is accetable for indoors and for night time viewing, but if you have a phone like the LG G2, your phone will look a heck of a lot better than this tablet will side-by-side. That's not to say the screen is bad, it's perfectly usable, with solid viewing angles and Nvidia have even thrown in the option for you to choose your preferred colour settings so you can pick between the two 'Colour Correction presets' which are sRGB or Native. Personally we've chosen native because it seems to give more vibrant colours to our eyes, but it's probably a personal preference. Naturally we can't talk about the screen without talking about the stylus. It's really nice and it works exactly as advertised. The stylus gives you the added precision which you simply can't get with your fingers and the pressure sensitivity is a really nice feature, if only for showing off and possibly taking some notes, but it might be easier to type it out on the on screen keyboard. Palm rejection also works really well after you've hit the button. 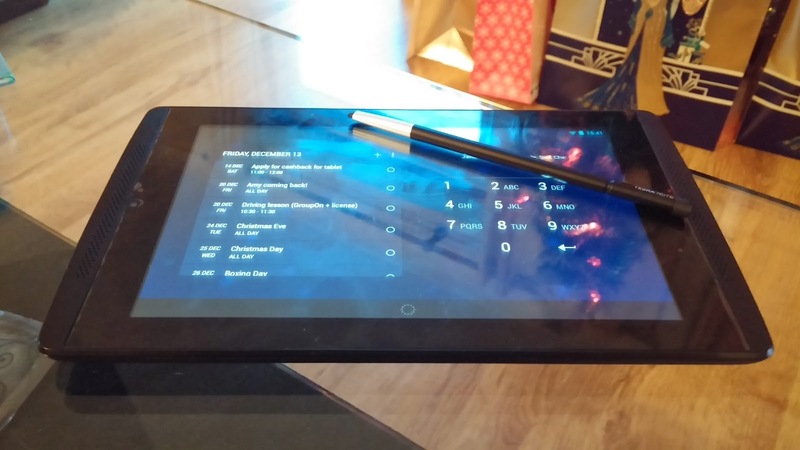 We must say, we weren't sure that the stylus would add any value to the experience on this tablet, but until you have it in your hands you simply won't know the benefits of having precision input. It's a really nice addition. 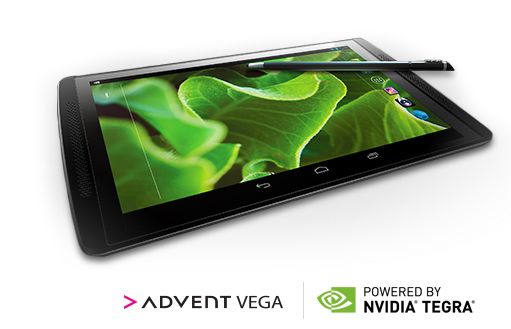 With a four-plus-one Nvidia Tegra 4 processor under the hood this tablet absolutely flies! Android 4.2.2 runs fantastically well and it's very rare in our day to day usage to notice any slow downs at all. 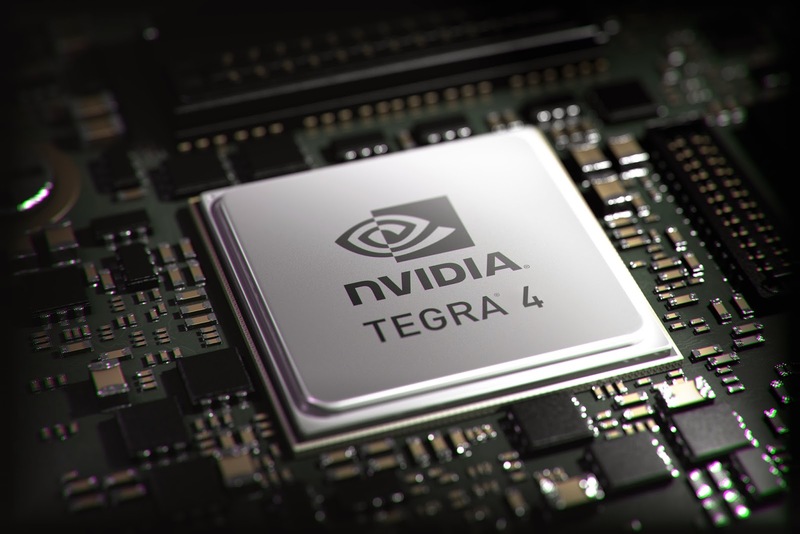 Undoubtedly the slightly lower resolution screen definitely helps here, but that's not to say that the Tegra 4 couldn't handle more if it had to. Even the one gigabyte of RAM doesn't seem to be any hindrance to 'normal' performance - we could have as many apps open as we would normally use without noticing any drop off in performance. Just as a disclaimer, we've had this thing for about a month at the time of writing, so we genuinely have experience using this tablet! just that app, given that it's slow opening on the Snapdragon 800 in the LG G2 too! 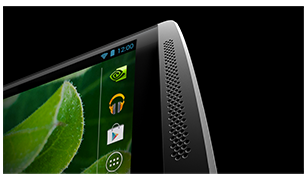 Nvidia have tried to keep the version of Android 4.2.2 on here relatively stock and they've achieved that with the only noticeable change happening when you pull out the stylus, which gives you the lasso option and the reject palm option too! In terms of raw performance you really can't go wrong with this tablet and if Nvidia keeps up with their update schedule, that is to provide a 4.3 update by the end of December and a KitKat update in the new year then there will be lots of happy owners of this tablet. All in all the bang for your buck in terms of performance is absolutely tremendous and it's just a case of deciding if you would rather have the better quality screen of the 2013 Nexus 7 for a higher price point. The Tegra Note 7 comes with 16GB of internal memory, which gives you about 12.5GB free for your data after the system has taken its own little chunk. That's not too bad, but remember you can always just add in a micro SD card to the tablet and we've been using a 32GB card without any problems! This will be great news for you movie, music and gaming enthusiasts looking to pick up this tablet! Given that this is relatively thick device with a low-resolution screen we were expecting this thing to be amazing with battery life. It's not quite amazing though. Normally we can squeeze about two days of battery from the tablet. That's with watch a couple of hours of YouTube before bed and browsing on the sofa during the evenings. this is the setting which we use, 'Maximum Performance' which lets you use all of the processors punch without capping frame rates and 'Save Battery' which only lets two of the cores run at a capped speed of 1.8GHz and with an app frame rate limit of 30 FPS. Honestly, unless you are gaming you can probably get away with running the 'Save Battery' mode at all times without noticing much of a difference. This is a nice little addition to have though. and it's a definite improvement over the default Android app. 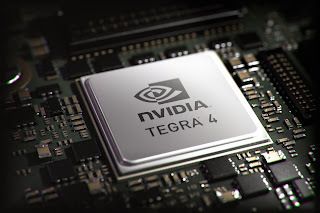 The 5MP camera takes acceptable, if not amazing pictures and hopefully things will get even better when Nvidia deliver the update which will give always on HDR, which is meant to be coming in the December update. The speakers, on the other hand, leave nothing to be desired. Most importantly they're front-facing, secondly there's a little bass port to make sure things don't sound too tinny and thirdly, they're really good speakers. If you're a movie buff, YouTube obsessed or just someone who likes listening to music while browsing, then you can't go wrong with this little device. We're really impressed by the speakers on offer here. We're really, really taken with this little tablet. We know that there are trade offs such as the screen, to hit this lower price point, but when everything's said and done there's not much to complain about at all for prices between £160 and £180. Yes, the Nexus 7 has a nicer screen and faster updates, but it doesn't have those great front facing speakers or a pen input. 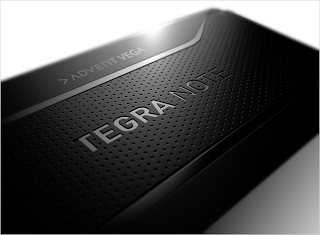 With those things in mind we're happy to say that the Tegra Note seems to have landed in it's own little niche and you should definitely consider one if you're looking for a budget tablet with a lot of bang for your buck! You can pick one of these little beauties up from PC World here!